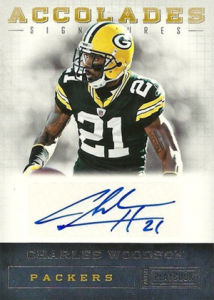 What Are the Most Valuable 2011 Panini Playbook Football Cards? With the release of 2011 Panini Playbook Football and 2011 National Treasures Football, Panini has officially closed the door on last football season. They went out with a bang, releasing the two high-end sets within a couple of days of each other. Earlier in the week we counted down the top 10 2011 National Treasures Football sales, noting seven sales that passed the $2,000 mark. That's not the case with 2011 Panini Playbook. However, it is worth noting that while both sets are pricey, National Treasures is the crown jewel of their football card lineup. So to expect such high secondary market prices for 2011 Panini Playbook may be unreasonable. There are some patterns among the top sales and none should be surprising. Like the 2011 National Treasures list, Cam Newton is all over the top sales. His rookies, which are numbered to 299, feature both an autograph and a jumbo patch piece. They're also book cards, which further makes them stand out from of Cam Newton rookie cards. The book card format, which is used throughout the set, bodes well for team collectors. Chronicles Signatures feature up to eight autographs. Most are centered on a single team, making for some nice city-centric combinations. 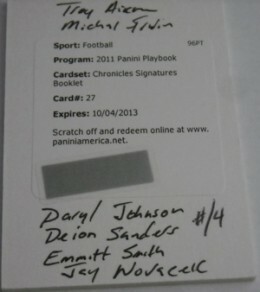 The top sale for 2011 Panini Playbook thus far is for Chronicles Signatures booklet redemption featuring autographs from six Dallas Cowboys, including Troy Aikman, Emmitt Smith, Deion Sanders and Michael Irvin. The card sold for an even $800. A similar card with six Pittsburgh Steelers went for $695. Players on the Steelers include Ben Roethlisberger, Jerome Bettis and Troy Polamalu. A card with four Kansas City Chiefs closed at $271.99. Within the next couple of days, at least one other Chronicles Signature card will join the list as a card with four Packers and four Steelers is currently sitting at $535 on 20 bids. The auction closes Friday night. The Cam Newton rookies, which fall under the Rookie Booklets subset, have sold for as high as $355 but seem to be settling closer to $200 for now. 2011 Panini Playbook Football boxes come with four hits, at least one of which is an autographed memorabilia book card. Here is a list of the top 15 realized eBay prices during the first week of sale for 2011 Panini Playbook Football.